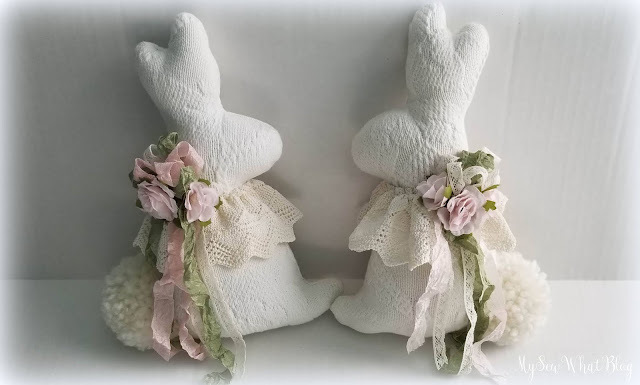 Oh Linda these are just fabulous, I totally love them, you did such a beautiful job dressing them up and I love the different fabrics you chose to use to make them too, Wonderful addition to any spring decorating! Thank you Connie! I do love making them! Have a nice weekend! They are all so neautiful! Each one has its own look even though they all look related. Thanks Vee! Hope you have a nice weekend! Sure could use some warm weather! Just too adorable Linda. Love their sweet tails. Thanks Kris! Happy Friday to you too! 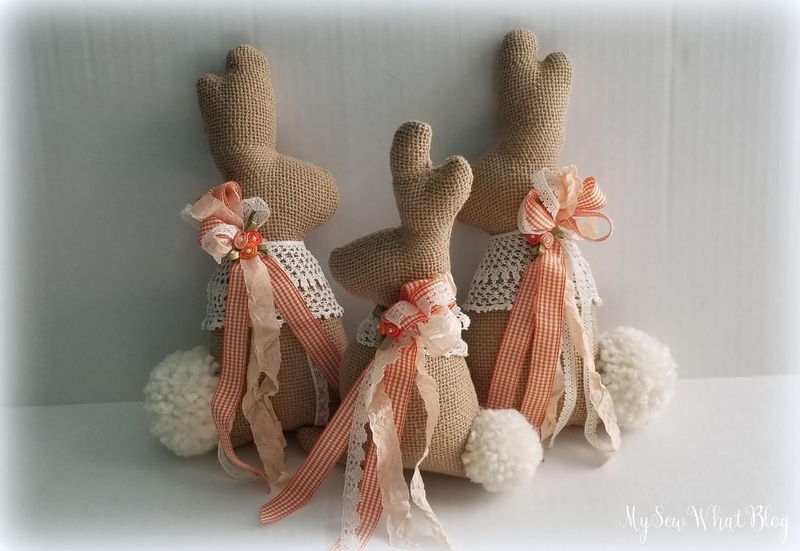 These are so sweet and adorable! And a perfect gift for kids. I love all the different colors and how you added the special touches of flowers and lace and ribbons. Thank you for sharing. Hi Tamara, thanks so much for your kind words. 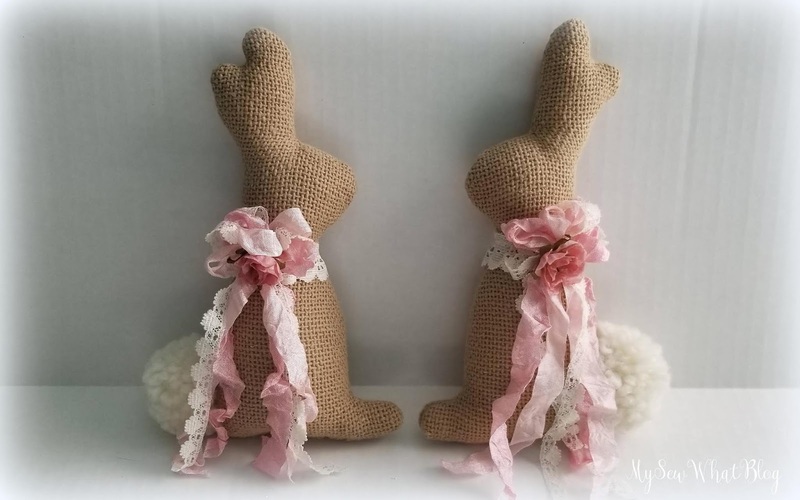 These bunnies are so fun to create. 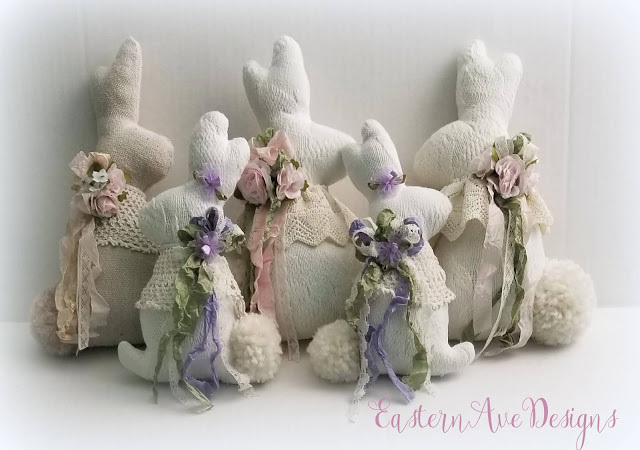 They are more of a home decor item though but would certainly look cute in an Easter Basket as a table decoration or as part of an Easter vignette. Thank you for stopping by! Happy weekend! 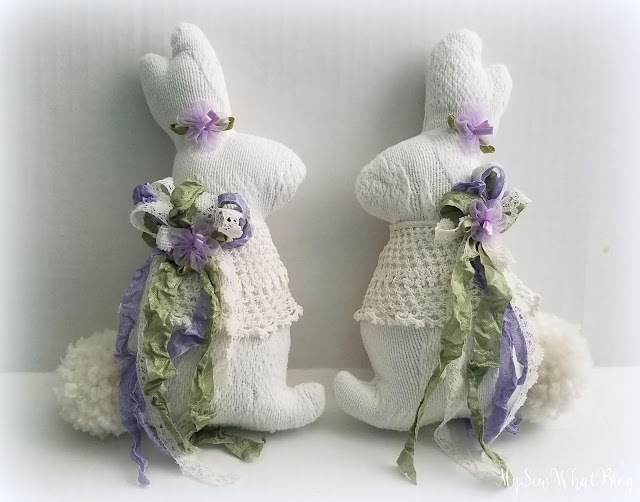 Oh my goodness, Linda, I adore your multiplying bunnies! Each and everyone is so cute! You've embellished all of them to perfection! I love seeing your magical hands at work. Happy weekend to you, and happy sewing! Thank you Kitty!Such fun to make. I think working with the spring colored ribbons and flowers helped me get through the winter. I need spring! Have a nice weekend my friend! Oh my gosh, Linda, all your bunnies are adorable. Why, I cannot choose a favourite. 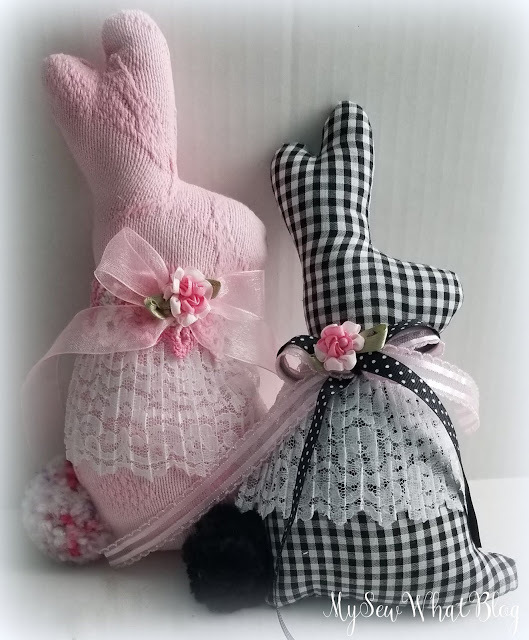 I love all the pretty trims you added to each sweet bunny. Love those fat pom pom tails. How delightful to have bunnies multiplying in all their gorgeousness. Thank you very much Kim! So much fun to make! I confess that I was a little sad to send the first pair off to Florida! Seller's remorse! ;( It happens sometimes! Happy to hear from you! Absolutely gorgeous,I love all of them.Great artwork!!! Hi Maristella, thanks so much for dropping by. I always appreciate your visits and kind words.Hugs! wow so pretty and Easterish. Thank you so much and yes! I love stuffed little critters as well! Lol! Have a nice week! Linda, you do such amazing work! Each bunny is really a work of art! I love how you artfully take beautiful vintage lace, bedspreads and create such beauties with them! How hard it must have been to ship them off, it does seem like a part of your heart is in each creation! They are all just darling!! So good to stop by for a visit, and to see what your talented hands have been up to! Hoping that Spring comes soon to your world! We've had some amazing sunshine weather here and actually need the rain that we should be getting tomorrow, lol! And that is still with snow on the ground, rather crazy! Anyway, blessings to you sweet friend!!! HUGS! Hello Marilyn! So nice of you to stop by. Thank you for your sweet comment too! I find that making seasonal pieces is a nice break from the regular things I sew and lots of fun! It's been so windy here for the past several days, but also sunny so I can see that spring is definitely coming. Looking forward to warm, sunny days and the first signs of green! Enjoy your sunshine! Love and blessings to you to my friend!